Everything is back to normal. The conference is over and my friend Avril has gone back home to Australia. The picture shows Avril next the poster with our star, Lizzie. 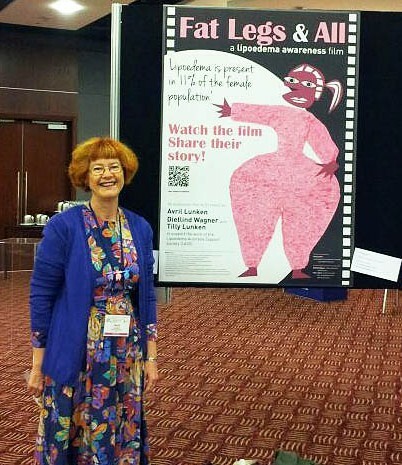 We had brilliant feedback about the film from the people who watched it at the conference. Personally, I know more about Lipoedema now than I ever wanted to know :), but I guess this is why I like to get involved in such projects. Most people were surprised that we did the film without funding. Avril and I had talked about whether we should seek funding for the project in the beginning, but it was in the too hard basket for both of us, particularly as we were working in different countries. I myself have no experience with funding agencies and I believe seeking funding would have slowed the whole thing down and made the process more cumbersome. Congratulations on the success of this collaboration. Thanks, Al. It’s amazing how quickly one moves on from one project to the next.